So I went and registered my vehicle oooh, about three weeks ago. Today my license plates arrived in the mail. 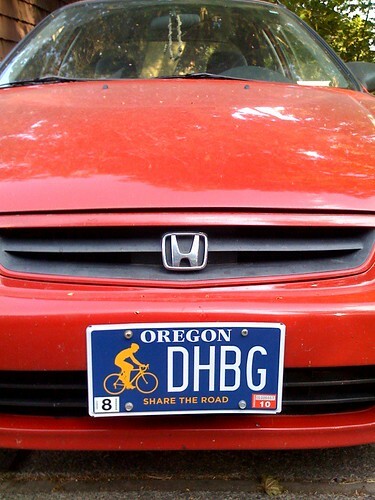 I was pretty excited to learn that Oregon has these “Share the Road” plates, which for every person who registers their car and gets these plates, some money is set aside to better the roads and the urban conditions for cyclists in Oregon. This mostly appealed to me because once school starts i will be commuting mainly by bicycle. I’m not sure how much money is set aside but the plates were only $10 extra dollars. Looking at this photo that i took with my new iPhone, that my car needs a wash. Sadly enough, this car, once my pride and joy, is nearly 10 years old now and I am beginning to care less and less about the ol’ red dragon and her performance. Hopefully, when I become web famous, BMW will donate a shiny new vehicle to me. Schweet plates brah! Glad to see that even though you don’t ride, you support the cause.